The Rescue. Seven People. Seven Amazing Stories… by Jim Cymbala with Ann Spangler, published by Zondervan, 2017. I was intrigued by the offer to review this book. Broken lives finding new hope and direction, grace and redemption, rising up from despair to glory. I enjoy reading stories of personal reflection, survival and growth and couldn’t wait to read this one. The Rescue was not quite what I hoped for. The author presents the personal stories of seven people, “friends” he calls them, providing a platform to share their own experiences with no additional comment or exploration. Each first-person narrative follows a similar formula: person has challenging childhood, grows up to be a troubled adult, enters into questionable and generally abusive relationships, life falls apart, person is led to church and finds redemption in the gospel. In his introduction, Cymbala does level set the reader’s expectations. There is no accompanying survivors’ pep talk, self help manual, or seven step plan. He simply wants to share real life stories and let them stand on their own. I’m not sure that they do. I would have liked more. To be fair, the author did add a very short section at the end, letting us know that if we are also struggling, help can be found by reading the Bible and praying daily. Maybe it’s that simple. I think there’s more to it and wish the author would have delved deeper. Do I recommend The Rescue? If you simply want a few short stories of despair and Christian salvation, this might be a book for you. If you, like me, want to know more about the triumph of the human spirit, understand the real struggle of overcoming abusive relationships, wonder how to change the generational cycle, or are intrigued by how to take a dire circumstance and reclaim a productive future, The Rescue will leave you still searching. 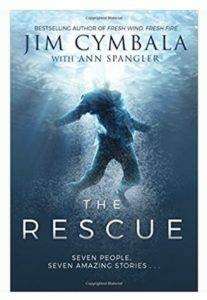 Click here to buy The Rescue on Amazon. Note: A copy of The Rescue was provided at no cost to me. In no other way did the author or publisher influence the content of this review. I always try to see the upside of life, filtering everything through my positive attitude. Whether dealing with everyday life or elevating emerging leaders, we can learn from the past, must live fully in the present and be ready for an exciting future. Join me on the journey. Let me review your book!